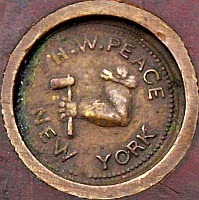 A medallion with the maker's logo is one of the more distinctive parts of a saw. Medallions are invaluable for identifying and dating old saws. You might be surprised at how many different saw medallions exist. I know I was when I began to catalog them. Check out the Saw Medallion Reference Guide for pictures of 240 different saw medallions from eight different countries.